San Francisco, CA -April 6th, 2016 - Fiilex, a leader in LED lighting for the broadcast, film, and photographic industries, is proud to announce the release of the Matrix, a new panel-style LED light. With the Matrix, Fiilex has incorporated four of their proprietary Dense Matrix LED arrays into a single fixture, resulting in a powerful hybrid light with a unique feature set. Beam control is an area where the Matrix truly distinguishes itself from other panel LEDs, and Fiilex is offering various accessories to put that control in the hands of its customers. Users can cut the light with the Matrix Barndoors, focus it to 3x intensity with the Matrix Fresnel Lens, or maximize diffusion with the specially-designed, speed-ring-free Matrix Softbox. The Matrix boasts a brilliant 1500W-equivalent output which can be dialed between 2800 and 6500K while maintaining exceptional CRI (>93). Adjustable hue (±0.25) is perfect for accentuating skin tones, and the dimmer functionality runs from %0-100 with no color-spiking. 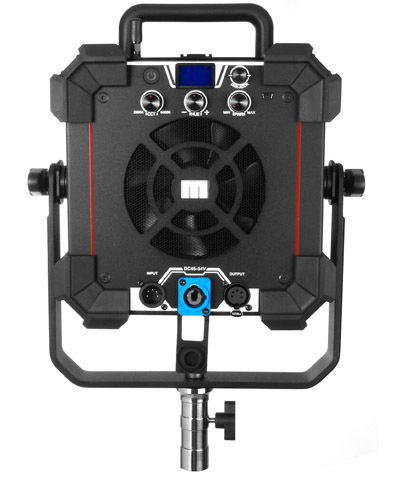 The fixture itself weighs only 9.5 lbs (4.3 kg), minimizing transportation hassle, while its durable construction and IP-24 weather-resistance make it rugged enough to handle the hazards of remote location shoots. "We're excited to introduce our first multi-source light," states Fiilex brand manager Brent Siebenaler. "Our goal was to design a softer light source but still maintain flexibility, punch and our world-renowned color rendition, characteristics that all our other products are known for. This is not another standard panel light." Fiilex is a DiCon Lighting Brand. The Fiilex division designs and manufactures high quality LED lighting products for the Image Capture industry. Incorporating patented Dense Matrix LED technology, Fiilex produces portable and powerful specular sources that boast high Color Rendering Index (CRI) and dynamic color tuning capabilities. Since the initial announcement of the brand in January 2013, Fiilex has released 8 revolutionary LED lighting fixtures and a variety of innovative light modifiers. In a very short span, Fiilex has won major contracts in the North American broadcast market and established a wide dealer network around the world. Fiilex is one of the most sought after new lighting brands in the market.